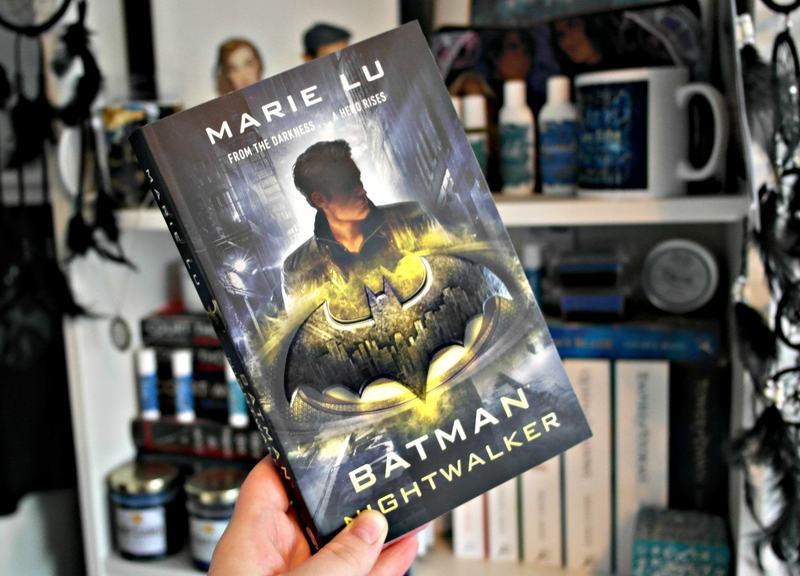 In late 2017 I received a copy of Batman: Nightwalker* by Marie Lu (thank you Penguin, especially Sarah!) and I’m so grateful because this was definitely an anticipated release of mine! I was majorly excited when I saw the parcel sat in my porch and ripped it open with more enthusiasm than was probably necessary. With my dad being a huge comic book fan I’ve grown up with superheroes, and Batman has always been a favourite of mine and my dad’s. We even met the original Batman Adam West when I was a baby! So, I knew I would love this book and I couldn’t wait to get stuck in, especially as I fell in love with Marie’s previous release, Warcross. I was also obligated to read it as fast as humanly possible as my dad was desperate to get his hands on it. Batman: Nightwalker is the second in the DC Icons four book YA series brought together by Random House. Wonder Woman: Warbringer by Leigh Bardugo was the first, and Batman will be followed by Superman by Matt de la Peña and Catwoman by Sarah J. Maas, which I’m already far too excited about because of my love of both cats and Sarah. Not only am I writing my review today, I’ll also be posting a mini Q&A with Marie Lu herself, how awesome is that! So keep reading to find out my thoughts, who Marie would like her superhero sidekick to be and more. And don’t worry, it’s all spoiler free. After recently reading Warcross by Marie, and being in total awe of her writing, I had high expectations for Batman: Nightwalker. I was not disappointed. Thanks to Marie’s superb writing skills, I could visualise the story like a film from page one. I found there to be just the right amount of world building; enough to give us a glimpse into Gotham city’s past, present and current social climate, but not enough that it became monotonous or info dumpy. While I’m not usually a techy person I definitely enjoyed reading about WayneTech, including the cars, gadgets and software that they create. I particularly appreciated how the classic Batman technology and gear were brought into the story through Lucius, the head of Research and Development. Particularly, the subtle nods we see throughout the story to the Batman we know and love, such as the suit, the “opaque black helmet and a black armoured body suit made of latticed fabric” which distorted Bruce’s voice, the long coat he wore which seemed like a cape as he stood overlooking the city and a couple of references to bats. I liked that these points were not cheesy or too overt, but were clear enough to those familiar with the story. Batman: Nightwalker was primarily plot driven, with action taking place throughout; the last half of the book was particularly action packed and kept me turning page after page. Whilst there were certainly a lot of fights and criminal activity which we have come to expect from Batman, I was surprised to find that the plot was actually quite moving too and definitely drew a few different emotions from me throughout. I enjoyed being able to see “Bruce behind the mask” as such, before he truly becomes Batman and is just an eighteen year old billionaire tying to fulfil the legacy his deceased parent’s left behind whilst constantly striving for justice and what is right. Throughout the story, Bruce felt tangible to me, like I could see him perfectly as though he was someone I had met before. Again, this is testament to Lu’s talent. Though I would like to have seen a little darker side of Bruce, I guess this comes with age! The friendship between Bruce and his best friends Dianne and Harvey Dent (!) was also a high point of the story for me. It was clear to see how close the trio were, and that they constantly had one another’s backs no matter the consequences. And Alfred, the pure ray of light that is Alfred, Bruce’s butler, guardian, friend, person-who-distracts-the-cops-so-you-can-escape-from-jail and will-help-beat-up-the-bad-guy. Who couldn’t love him! We even got an introduction to Commissioner, well at this point, Detective Gordon which was pretty cool. As hinted towards in the blurb, there is a romantic element to the story, though I never felt that this overshadowed the plot but only added to the tension, as I’m sure was intentional. I can’t really say much more about this without spoiling anything, but I will say that I did find myself constantly questioning the love interest’s motives and trying to figure out the truth, or take a guess at the big plot twist! Another well written and well structured character who again was so vivid in my mind. Something that I don’t think I’ve ever seen before in a YA book is the direct mention of white privilege. Lucius says to Bruce “If you didn’t look the way you did, the police might have shot you dead for pulling a stunt like that” to which Bruce realises that “his pale skin may have saved his life”. Props to Marie for including this, and it’s something I think should be highlighted more, especially due to its unfortunate relevance in today’s society. Q & A with Marie Lu! If you were a Superhero like Batman, and you could choose any book character to be your sidekick like Robin, who would it be and why? Inej Ghafa from Leigh Bardugo’s Six of Crows—although I feel like she would end up being the one saving the day, while I’d be squinting at my GPS while lost in Gotham City. Is there a particular message that you wanted to get across in your take on Batman? One of the most endearing qualities about Batman, to me, is that he’s a billionaire who could live anywhere in the world—but he chooses to stay in grungy, grimy, crime-ridden Gotham City in order to make it a better place and carry on his family’s legacy. I wanted to echo that in my take on Batman. Even though your city or country is broken in countless ways, it’s still your home—and you’re still willing to fight for it, to change it for the better. I recently read Warcross (and absolutely loved it!) and got to thinking that Gotham City could totally use something similar with virtual reality to help catch their criminals. Do you think the two worlds could ever work together? Thank you! And yes, absolutely! I actually did end up putting a little bit of virtual and augmented reality into my Gotham City, for that reason. Bruce Wayne just isn’t Bruce Wayne without some cool tech behind him, and I think he (and poor overworked Gotham City Police Department) could really use upgraded cars and VR goggles. I just finished Celeste Ng’s Little Fires Everywhere, and it absolutely blew me away. It’s one of the best books I’ve read in a while. If you could recommend only one book or one author (I’ll be kind!) who would it be and why? Augh! The most difficult question ever! I appreciate your kindness, haha. J.K. Rowling. She just cannot be beat, and my books—the entire children’s literature industry in its current state, actually—wouldn’t exist if it weren’t for her. Thank you so much to Marie for taking the time to answer my questions (and for writing another awesome book) and to the team at Penguin for making this happen for me. Another awesome blogging moment: unlocked! *This book was provided to me by the publisher in exchange for an honest review. Book depository affiliate links used. I get a small commission if you purchase through them, and you get free delivery!